Kelly Crawford is the founder/CEO at Joshua Tree Excursions (29 Trail Tours, LLC), a veteran-owned and operated outdoor ECO adventure tour company. He served honorably, in the U.S. Army National Guard and the United States Marine Corps for 23 years. The bulk of his time in the service was spent with the USMC as an Explosive Ordnance Disposal (EOD) Technician, where he supported both military and law enforcement organizations around the world, to include several combat deployments to Somalia, Iraq and Afghanistan. After leaving the service, but prior to founding 29 Trail Tours, Kelly was the Director of Business Development and Training for 6th Wave Innovations Corp, a nano-technology product development company. Kelly decided to leave the corporate world to pursue his love of the outdoors and nature and explore the planet with other like-minded individuals. Kelly spent his formative years in the mountains and valleys of Oregon. He has traveled extensively around the world exploring and discovering the hidden wonders of our amazing environment. Kelly resides in 29 Palms, CA - the gateway to Joshua Tree National Park - one of the most majestic of the National Parks. He lives by the motto that, "Life is a journey and not a destination." He possess a wealth of leadership experience, is an avid outdoors-man and an expert in survival, navigation and back-country expeditions. Kelly lives and works in Joshua Tree, CA with his wife Jennifer, of Desert Birth and Wellness. There they, along with their SIX girls, are enjoying the journey. Rich was born and raised near Baltimore, Maryland. Although he spent time outdoors playing as a kid, the bright lights and fast pace lifestyle of the city life called to him for a long time, more than anything else. After graduating from Towson University, Rich moved to downtown Baltimore where he held just about every job in the bar and nightclub industry. One day, a close friend recommended that he take the day off and go hiking to help relax and recharge from the non stop lifestyle he was living. Rich took his friend's advice and drove to Harpers Ferry, WV. Although Harper Ferry is not too far from the city, it was a completely different world for Rich to experience. He ended up hiking for a few miles on the Appalachian Trail that day, and found himself taking the time to hike in local state parks shortly thereafter. 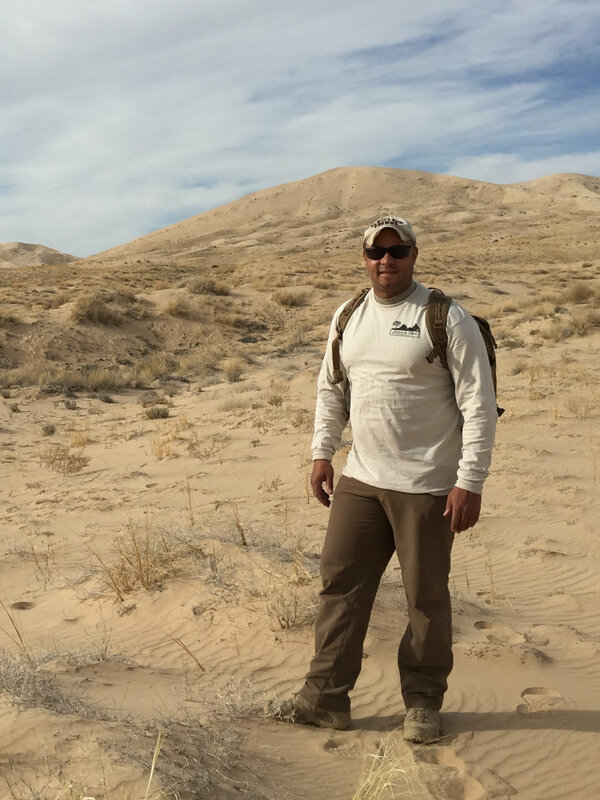 After a three week drive around the country, Rich fell in love with the American Southwest and moved out to San Diego, where his love for hiking was taken to the next level with the beautiful weather and prevalent outdoor culture that SoCal has to offer. After leaving San Diego, Rich moved to northern Arizona where he fell in love with the beautiful and unique mountain and high-desert landscapes. After a chance-meeting with the program director for a tour company in the Grand Canyon, he knew he had found his calling. Rich was also introduced to yoga in AZ, and is currently pursuing a 200-hour teacher certification. His time here in Joshua Tree has been a wonderful and unique experience, and Rich loves nothing more than to take his clients on a journey through this amazing landscape, that they will remember for the rest of their lives. Growing up in Southern California, Carmelina’s love for the outdoors began at a young age. As a child she went on family camping trips in the San Bernardino mountains and San Diego beaches. As she grew, her love for the outdoors snowballed into her passion. She would spend her free time backpacking in the Sierra, eventually climbing Mt. Whitney. In 2016 she thru-hiked the 500-mile Colorado Trail from Denver to Durango. Carmelina married her U.S Marine husband in 2009. Together they have lived, worked, and played throughout California, North Carolina, and Hawaii. In 2017 her husband received orders to MCAGCC Twentynine Palms- a Marine Corps base just outside of Joshua Tree National Park. Upon moving to the area, Carmelina began volunteering with the national park and eventually began working as an information specialist with the Joshua Tree National Park Association. At the National Park’s visitors center, she lead interpretive programs on the natural and cultural resources of the unique desert park. In the summer months Carmelina works as a backpacking guide in Yosemite National Park. Carmelina’s hobbies include hiking, backpacking, and landscape photography. Her photography gallery can be viewed on her website Carm Explores Photos. Born and raised in Northern Los Angeles, CA, Zack immediately found a passion for exploring and pushing himself in the outdoors. After high school, Zack discovered rock climbing and immediately fell in love with it. Zack’s drive to climb beautiful features and formations, has led him to travel across the states and abroad in search of rock formations to climb. When he isn’t out on a climbing trip, you can find him climbing in his local crags, Joshua Tree and Tahquitz, or training for his next ultra-endurance run. He is currently an AMGA certified Single Pitch Instructor and is actively pursuing certification in the Rock discipline. Our astronomer, and Night Sky Presenter, Steve Caron, has been studying astronomy from a very young age. Originally from the San Francisco area and later on, Los Angeles, he moved to Hi-Desert in 2013 to pursue astronomy related projects where he committed himself to do public outreach astronomy and educational programs. Steve was the lead astronomer with Sky's the Limit from 2013 to 2018 where he developed and directed weekly public outreach programs, including the Night Sky Festival. He is currently a volunteer night sky guide for Joshua Tree National Park and the lead astronomer with the Twentynine Palms Astronomy Club. Steve is also an expert astrophotographer and telescope repairman. Steve has an unequaled passion and knowledge of astronomy and the night sky, which he most enjoys sharing with others. Starman Steve is a true night owl, but during the daytime hours he is a musician and music educator, playing horn and trombone with several local music ensembles as well as directing the 29 Palms Youth Orchestra.